One happy boy at the finish line! 6th OA and 1st Master. As has become a recent practice of mine, I try to find the cheapest hotel possible for the night before any race that requires more than 2 hours of travel. This time was no different, except that this place was actually kinda nice unlike previous establishments I resided in. It had a working A/C unit and TV remote and I didn't feel like I had to put the chair under the door handle to prevent drug dealers from entering my room...which I have had to do on similar trips in the past. Just as well since my wife was with me this time to enter her first trail race ever. After a recent road half marathon we ran together, she decided it was time to take the next step and check out trail racing. So when I decided to run the Rockin' Choccolocco 50K, she went online as well and registered for the Half. I am usually pretty good at the logistics and planning stuff, but I once again made the error to not print directions beforehand, otherwise I would have noticed some weird stuff and route information in the turn by turn directions before we ever got on the road. I thought I had smartened up. Instead of relying on Google Maps which had previously sent me down some suspect jeep roads for miles instead of taking me along a nice 15 mile asphalt road to the race start, I used Apple's own maps app (Advice: If you ever run the Merrill's Mile event, be sure to avoid the Jeep/Forrest road and instead follow proper roads, which will get you there much faster AND safer:-). Biiiiig mistake. Once again, I was told to take a Forest Road when we were still 20-30 miles from the race location. I though, not this time, I know better, so I got new directions. After a bit more confusion, we finally managed to align with the directions RD Todd Henderson had provided as part of the race instructions. Alright, I thought, piece of cake...until we came to a quiet stretch of road. We felt that our turn had to come up any minute but we didn't see any signs. So what did I do? I opened up Google Maps one more time for some final directions. With only a mile to go, surely we couldn't get lost, right? Wrong! Once again, we were sent down a jeep road and once again, it was wrong. The road dead ended and I had to maneuver our faux SUV around to get back to the main road...we did this two more times and now I was getting slightly stressed. We still had plenty of time, but I was out of ideas, so we decided to just keep following the main road until we saw ANY signs and sure enough, less than a 1/5 mile just around a bend in the road we saw the turn sign for the Campground, ugh! We arrived at the race with plenty of time to spare and another lesson learned: Do not rely on your GPS...EVER! As we arrived at the race location, we immediately saw a familiar face, Graham Gallemore, an ultra legend if there ever was one. This guy runs more ultras than anyone I know and all at the tender age of 71. After getting our gear ready, hand bottles for me and bladder pack for my wife, we headed to the registration table to pick up our race bibs and swag. This event is in its second year, so the number of participants wasn't as high as I think it should be for this event. 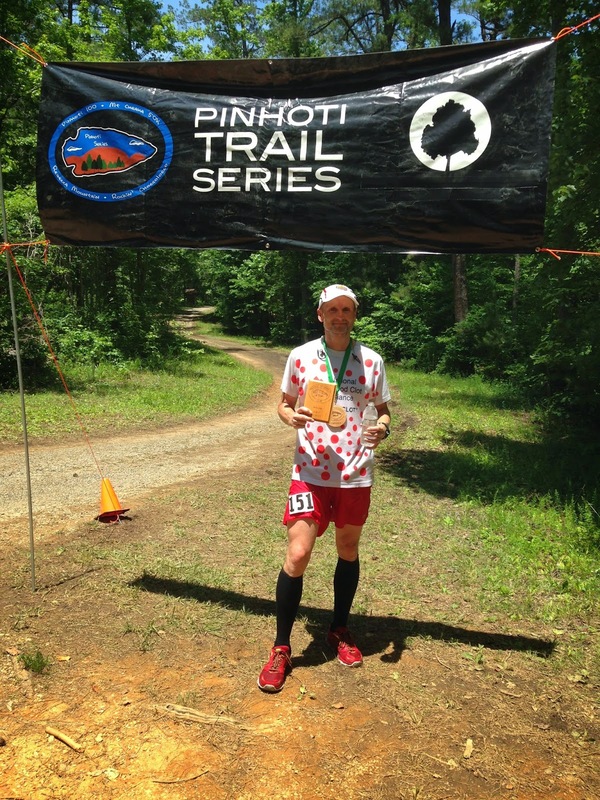 It is part of the Pinhoti Trail Series put on by Todd Henderson and he and his wife put on some quality well run events. 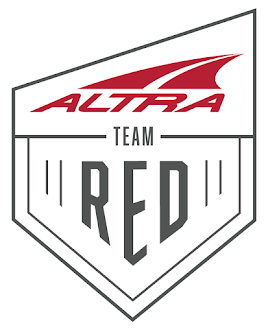 If you're looking for a fun trail race in June in the Southeast, this one should definitely be on your race calendar for next year. I had looked at a course map days earlier and new it was an out and back course on the Pinhoti trail, which suits me well. I am training for the Pinhoti 100 in November, so I appreciate any opportunity to run on a section of the Pinhoti trail, which is why I also ran the Mt. Cheaha 50K in February, also a fantastic event. The elevation profile did not look to intimidating, which could mean good and bad news all at once. Sometimes, when you're having a rough race day, it can be nice to have a steep climb, allowing you to use it as an excuse to maybe walk for a minute and take in some fluids and food. A lack of serious climbs means that you are more likely to run the entire course and to run it maybe a little harder than you should. Well, at least that's what usually happens to me and this race was no different, except, I actually accomplished my race goal. Just before 7:30AM, Todd welcomed the runners and made his prerace speech: "Be careful out there, lots of ticks to worry about, use some vinegar spray." That was it, short and sweet as usual:-) We all took off at 7:30AM sharp, both the half marathoners and the 50kers. The race course took us down a short jeep road followed by a short road section before we entered single track trail. It felt like I was way in the back of the pack and everyone was flying. It was the strangest thing, I was going 9 min miles which I thought was still too fast for my overall pace goal, yet there was what seemed like a ton of runners ahead of me. Oh well, time to focus on your own race, I thought and settled in to my early race pace. I had played with different race pace targets and goal finishing times the week before the race just because I enjoy doing so. I decided on an A and B goal with the A goal being 5:15 which would have been a 50K trail race PR and the B goal being 5:30, which would still give me a solid finish based on my current training and personal fitness level. With the field being rather small (50 or so 50K starters and 30 or so half marathon starters), I ended up running mostly by myself rather quickly. The field was stretched early on and my mind started to wander. I really enjoyed the trail and the surroundings, I started thinking about my big goal race for the year and how I needed to progress in my training, and on and on. Before I knew it, I was approaching the half marathon turnaround. At this point, I had only seen 3 runners turn around. Oops, maybe I was still going a little too fast for my own good? Anyway, now it actually got me thinking. Does that mean that there are still a ton of runners ahead of me as I could've sworn I saw a bunch of peeps ahead of me at the race start. Oh well, who cares, move on and run your race. As I was running along I made yet another decision, to do everything I can to run the entire course, e.g. no walking whatsoever, none. That was the goal. I had actually managed to do so for the first time last month at the Strolling Jim 40 Miler, albeit ever so slow, but running is running. It was actually a fun little challenge for myself. Yes, I had to shorten my stride and yes I slowed down, but I was moving well and I considered it a training race anyway, so what if my legs blew up later. 2 hours 20 minutes into the race, the eventual winner of the race, Owen Bradley, headed my way. Wow, he looked like he was flying. I wondered how long it would take me to get to the turnaround. 4 minutes later the next guy headed my way and then another and another. Suddenly, I was at the turnaround and I had only counted 5 guys ahead of me. What?!? Holy crap, I'm actually doing well. Oh no, does that mean I have to continue to do well? Actually, knowing where I was in the field actually gave me a great boost of confidence and energy. I shoved some food and fluids down (nothing better than Coke in a hot ultra), turned around and continued to run. This section from the turnaround felt like it was downhill for almost 2 miles. Oh yeah, keep it going, I thought and boom, here comes a hill and another and another. My pace quickly slowed, but I was still riding a high. Until mile 20, that is. At mile 20, reality (read: stupidity on my part) reeled me in once again. I had decided the night before to forego my running vest and to just carry two hand bottles since the aid stations were spaced pretty conveniently. That meant skipping some of the gear I considered non-essential. Unfortunately, once of those "non-essential" items was an EpiPen prescribed to me by my doctor a couple of years ago after I was attacked by a couple of yellow jackets or hornets during an early morning trail run, causing my face and fingers to swell up like Will Smith's face in the movie Hitch and my entire upper body covered in itchy welds. Since the following allergy tests showed that anaphylactic shock was a possibility in the future, I was supposed to carry an EpiPen with me whenever I was out in the woods. Well, I hadn't been stung since that first incident, so what could really happen, right? Surely, a couple of Benadryl would be sufficient. They take up a lot less pace in my pockets, I thought. Well...I got stung. 10 miles to go in the middle of the woods and I had to make a decision. Do I risk making it worse by not taking the Benadryl right away and running on to see if I'll be okay, or take the pills right away and hope that I don't fall asleep along the trail. In the end, falling asleep felt like the most desirable risk at this point. After all, it could be worse, the Benadryl could prove to not be enough. In the end, it all worked out. I did end up getting a bit tired during the final 4 miles, but I chalked that up as actual exhaustion from the race. I did walk for a minute at this point, but I got going again pretty quickly. I managed to run the entire run on using a total of 2 Honey Stinger gels, a banana and a few orange slices as well as a couple of cups of Coke along with a bottle of water or heed between aid stations and 2 SCaps! roughly every 45-60 minutes, but not until after I had been running for 90 minutes. Never felt hungry or deflated. Finally, big thanks to Todd and his wife and their crew of volunteers. The event went off without a hitch and I always felt well taken care of at every single aid station. Thanks again for allowing all of us to enjoy this part of the Pinhoti trail.